My mother-in-law tried this recipe today for lunch and it was so moist and delicious!! 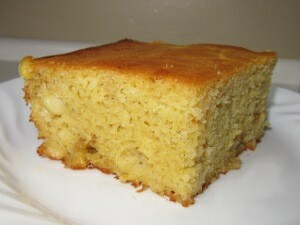 I love fresh corn in cornbread, and this is definitely a favorite recipe. She used the kefir in place of buttermilk, so dairy free kefir could be used also. Preheat oven to 350. Grease 9×13 inch glass pan. Combine cornmeal, sugar, flour, baking powder, baking soda, and salt. In medium bowl, whisk eggs, kefir, and oil. Stir egg mixture into cornmeal mixture until just combined. With rubber spatula, stir in corn. Pour batter into prepared pan. Bake 35-40 minutes, or until toothpick inserted in center comes out clean. Cool in pan on wire rack for 30 minutes. Slice and serve. 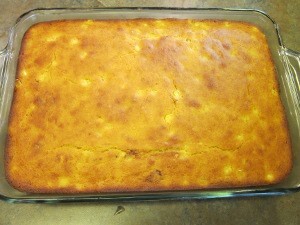 One Response to "Gluten Free Corn Bread -with fresh corn"
Yum! I wish I had a mother in law like that! what a treat!